An American jazz critic once said that Wes Montgomery was the “best thing that could happen to a guitar”. Grand words, one might say, quickly racking one’s brains to come up with other great names. 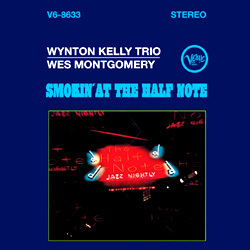 But after only a few minutes of listening to this live recording made in 1965 at the Half Note in New York, you will forget your brain-storming and concentrate on the unfussed performance of this brilliant guitarist and the superb Wynton Kelly Trio. The very first number of this album, which despite its tongue-in-cheek title No Blues is full of the spirit of black jazz, makes plain Montgomery’s unique talents. Highly polished arching melodies, sharply dissonant chordal runs and free improvisation displaying brilliant technique are the characteristics of this wizard of the “semi-acoustic” guitar. The quartet’s thrilling mixture of Blues, Latin and Soul is as fresh, modern and compelling as it was 30 years ago. This is music which gets down to the nitty-gritty, is always cool and straight with no fuss or frills getting in the way: the message comes over clearly – and it makes the blood surge through one’s veins! The almost tangible atmosphere of the recording venue and the pure sound quality further enhance this collector’s item and guarantee a jazz happening of the very highest order.